Captain Hakan Svedung talks about safety on Norwegian Gem. Recent tragic events involving certain cruise ships have caused some people to be concerned about cruise ship safety in general. Accordingly, I sat down with Captain Hakan Svedung of Norwegian Gem to talk about the approach to the question of safety on his ship. Before proceeding, it is appropriate to put the question of cruise ship safety in perspective. "They say it is more dangerous to travel to the cruise ship than cruising with the cruise ship, which I think is absolutely true. There is more danger for me to be back at home on vacation than to be onboard." Of course, this reflects the fact that a great amount of time, effort and resources is devoted to safety. "Our highest priority is the safety and security of our passengers and crew." 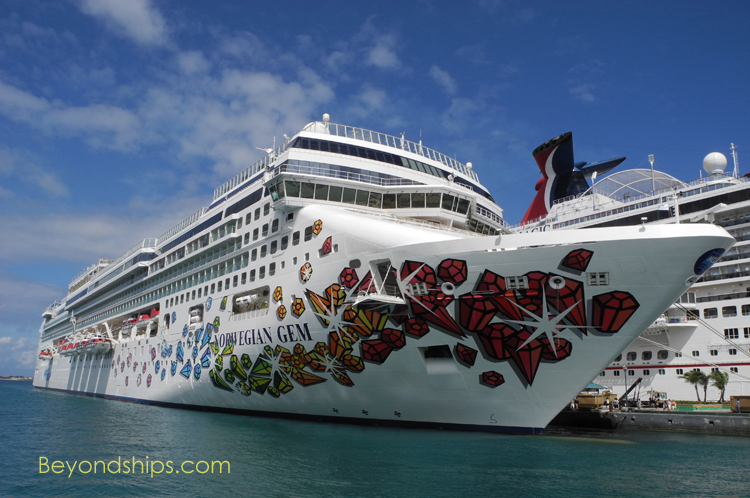 Looking first at the technology, Norwegian Gem is a quite seaworthy ship. "That has to do very much with the shipyard [Meyer Werft] where we built [Gem and her sisters] in Germany. I know that that shipyard puts in a lot of effort on the correct hull shape both for seaworthiness and for maneuverability." "The ships are built to take really bad weather - - almost any weather." Thus, there is little danger of the ship foundering due to the weather. Nonetheless, Captain Svedung strives to avoid taking the Gem into bad weather. "It is not so comfortable onboard. Furniture or people might fall over - that is why we do not bring them into bad weather because someone might be hurt. We even cancel ports. I know passengers may be disappointed but what they normally don't understand is that it is for their safety. All [such] decisions we take are for the safety of passengers. And Norwegian Cruise Line, they will never question us." Of course, the weather is not the only danger that faces a ship at sea. Indeed, the most famous sea disaster - - the sinking of the Titanic - - occurred in relatively good weather. However, Norwegian Gem is much different than the Titanic. Of course, Titanic did not have the radar and communications equipment that Gem carries. Moreover, Gem is constructed differently. She is divided into 19 watertight compartments. "We have watertight doors higher up in the ship, which today are called splash doors. On Titanic, the water came [over the top], from one compartment into another compartment." "Today it is totally different with regard to the lifeboats." Unlike Titanic, Gem has more than enough lifeboats for everyone onboard. In addition to the boats prominently displayed along the ship's sides, there are numerous canisters with inflatable life rafts inside. Still, "the best lifeboat we have is the ship itself. All systems onboard have back-up systems. I have been on this kind of ship for the past 19 years and I have never experienced that everything stops at the same time. The back-up systems always kick in. If one back-up system goes down, the engineering or technical people immediately get to work to recover it." There are also systems to detect emergency situations. "We have cameras and fire alarm systems and all the crew members - - they are the best system. They are our ears and eyes. They deal with situations very quickly." "Every single crew member has a safety duty. They very well understand how the ship works and how important [safety] is. Once we are at sea we are our own fire force, our own police force, we are on our own." "The crew is very well trained. We have a dedicated safety officer and his team doing all of the training. There has never been a problem getting resources or money for safety." When a crew member is hired, he or she receives basic safety training. "Then we keep on training". "We are doing training every single day. We have individual lifeboat drills with each and every group in the lifeboats. Then once a week, we are training everybody together to see that the whole organization is working. Fire drills take place throughout the week as well." The training also takes into account the fact that not every emergency situation the ship might encounter will be the same. "We have a lot of different procedures and a lot of different scenarios that we are trained in." The primary way that passengers learn about Gem's emergency procedures is through the passenger lifeboat drill. By law, a cruise ship must hold a general emergency drill within 24 hour of leaving the ship's embarkation port. On Gem, the practice is to hold the emergency drill even before the ship leaves the dock at the beginning of the cruise. All passengers embarking at a port on the cruise must attend the drill even if they have sailed on Gem before. Members of the ship's company direct passengers to their "assembly stations" (sometimes called "muster stations"). Once everyone has assembled the ship's safety procedures are outlined over the public address system. All bars, restaurants, shops and other passenger services are closed during the drill. Guests who fail to attend the drill, receive personalized attention. "They will get a letter from the Safety Officer. They will be called back [to do the drill], preferably the same day. If they do not show up, we will find them." In the past, the general rule in the industry was that passengers had to return to their staterooms prior to the general safety drill in order to pick up their life jackets. Norwegian, along with several other cruise lines, does not require them to do so. "There were accidents with the passengers stumbling over them. But we do demonstrate the lifejackets [at the drill], same as on the airplanes." It should also be noted that the lifejackets that are kept in the passenger staterooms are not the only life jackets onboard. There are also life jackets at the assembly stations and on the boat deck. Thus, if the nature of an emergency makes it impractical for passengers to return to their cabins, they will not go without a lifejacket. "Onboard here we have 8,200 life jackets. You will always be able to find a lifejacket." The passenger assembly stations on the Gem are indoors in the ship's public rooms rather than on the open deck by the life boats. The reason for this is that in an emergency, passengers might have to remain at their assembly stations for a considerable time and it is better that they not do so exposed to the elements. Passengers may be at their assembly stations for an extended time because Norwegian’s philosophy is that in an emergency, it is best not to wait until the last minute before acting. Thus, passengers may be asked to assemble long before there is any need to abandon ship. "Instead of waiting and saying: 'Now, we have to do something,' it is better to be proactive. It is easier to go back than to step up too late." Of course, while assembled at their emergency stations, passengers may well wonder what is going on. Captain Svendung believes that it is important to keep passengers informed during an emergency situation. "We will always inform them about what is happening. It is the same as when you are on an airplane - - you want to know what is going on. We will never lie to passengers. It is better to tell the truth." In addition to the drill, there is a sign on the interior side of the stateroom door that tells each passenger where his or her assembly station is located and how to put on a lifejacket. There is also a video about safety procedures that is played on the ship's television system. Cruise ship safety is not a matter that is left up to the individual ship. Cruise ships are subject to regulation by numerous different authorities. They are subject to the regulations of the International Maritime Organization, the country in which they are registered (sometimes called the "flag state"), and the various countries where the ship calls, which in the case of Norwegian Gem includes the United States Coast Guard since Gem is based in New York. This is not some vague system of regulation. "The regulation is down to details." In addition, it is active regulation. The Coast Guard does an annual and semi-annual inspection Other United States government organizations such as the United States Public Health Service make unannounced inspections as do the authorities in other ports where the ship calls. Furthermore, private bodies such as classification societies do inspections. On top of this, "we have internal inspections from the company and we do our own inspections. Many times it is the company - - they fulfill all the rules and regulations and they put on their own rules and regulations, which raise the safety a little bit more."